Long time readers of this blog know that I'm a big fan of the psychological aspects of traffic. So I was delighted to learn that Japanese scientists have been doing live simulations of one of the most enigmatic traffic phenomena... the shockwave jam. Shockwave traffic jams are patches of stop and go traffic that appear out of nowhere and seem to have no cause. Traffic engineers have been looking at shockwave jams for more than 15 years. Using computer simulations, they've worked out that the jam is started when a driver on a crowded highway slows down. That causes the following driver to tap the brakes, which causes other cars to slow down, and so on and so on. Computer modeling is all well and good, but until now no one's ever tried to generate shockwave jams with real cars on a real road. 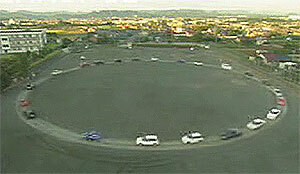 As you can see in this very cool YouTube video, the Japanese researchers spaced 22 cars around a circular track and started driving. Though the drivers tried their best to maintain a perfectly constant speed, they invariably sped up and slowed down by tiny amounts. Those tiny changes got amplified by the following drivers' reactions. Eventually there were times when some of the cars had to stop completely. There's a write up of the experiment in this week's New Scientist.